bebop spoken here: CD Review: Kristian Borring - Urban Novel. Kristian Borring (gtr); Jim Hart (vbs); Arthur Lea (pno); Mick Coady (bs); Jon Scott (dms). I was impressed by Borring's previous album Nausicaa reviewed here back in 2011. In the three years that have passed since that recording Borring has morphed into one of the finest, most tasteful and accomplished guitarists on the scene, with Jim Hart - one of the world's great vibraphonists - in the mix, the result is another triumph for the Danish guitarist and his team. As the album title implies, Urban Novel is a musical tale of life in the metropolis. Cool and laid back, fast and frantic, tender and reflective, sad and joyous - big city life as we know it whether as commuters, strangers or residents. All compositions are by Borring who moved to London in 2005 thereby suggesting that this is his take on our capital city but, then again, it could be Copenhagen, Paris or Rome - maybe, to me it's London. Jim Hart's solo on Number Junky I see as the hustle and bustle of Soho at night. Hidden Corners is the delightful discovery of something that's been there for years but which you've only just found thanks to Arthur Lea pointing it out to you as befits the action of someone described as a musical explorer and a 21st century Thelonious Monk. Jon Scott's drum solo adds to the thrill. If Borring, the architect, the painter of this cityscape and author (musically speaking) of Urban Novel, is the tour guide then bassist Coady is the driver who takes me there without a parking ticket or a speeding fine. 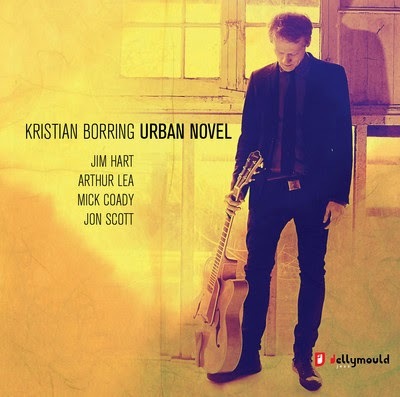 Kristian Borring - Urban Novel is available now on Jellymould Jazz.